Two people age 40 and 42, have died, following the collapse of a crawler crane at Sao Paulo’s Arena Corinthians stadium which is due to host the opening ceremony for the 2014 football World Cup. 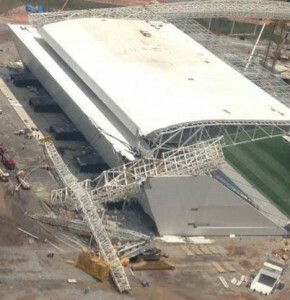 The boom of the crane, a 1,350 tonne capacity Liebherr LR11350 owned by Brazil’s largest crane company Locar, appears to have gone over the back of the machine breaking the superstructure connections and landing on the roof of the stadium. The crane which was working with suspended derrick mast counterweight was specifically brought in to install the large roof structure. Below is a video of the fatal crane collapse at Sao Paulo.